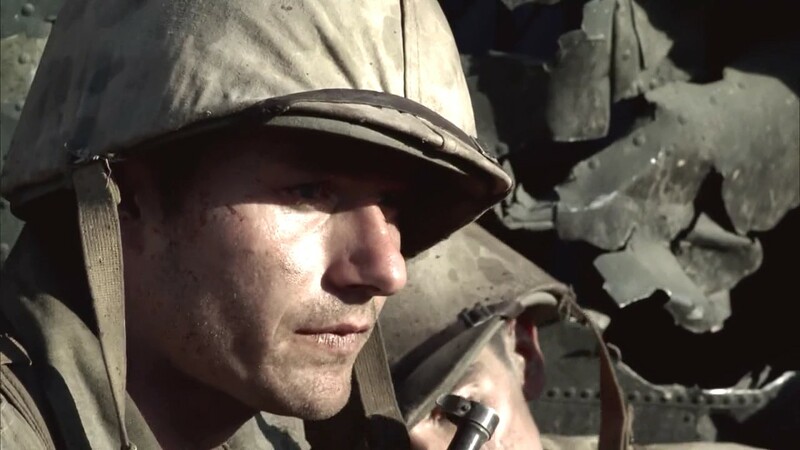 Before the first episode of ”THE PACIFIC” first aired, the producers had pointed out that the miniseries’ centerpiece would focus upon the Battle of Peleliu. Fought between September and November 1944, the battle is considered controversial amongst war historians. Many U.S. Marines had been decimated in a campaign that historians now view as unnecessary, because of the island’s questionable strategic value and the very high death toll. In fact, Peleliu had the highest casualty rate of any battle in the Pacific Theater. The efforts of the First Marines Division to capture the airfield turned out to be a brutal and bloody affair. Before storming the airfield, the Marines had to deal with a lack of water, thanks to the top brass’ poor preparations for the invasion. But the episode’spièce de résistance focused upon the battle that raged on the airfield. And so much happened. Both Robert Leckie and his remaining close friend, Bud “Runner” Conley (Keith Nobbs), were badly wounded during the assault. Eugene Sledge and his fellow Marines in the 5th regiment made it to the other side of the airfield . . . with a notable casualty in his company – PFC Robert Oswalt (Andrew Lees). He was the Marine who had described to Sledge a childhood trip to the Grand Canyon near the end of the previous episode. While Leckie and Runner found themselves conveyed to a nearby hospital ship, Sledge’s company continued its foray into the hills of Peleliu. Ashton Phillips gave an understated, yet first-rate performance as the returning Sidney Phillips, who paid a visit to Sledge’s family in Mobile. His Phillips seemed bent upon reassuring Sledge’s anxious parents that their son would make it through the war safely. Yet, the oblique expression in his eyes and his slightly intense manner seemed to hint that he is trying to convince himself, as well.